BMW has joined rivals in announcing a big push into electrified vehicles. The German luxury carmaker said that by 2025 it plans 12 all-electric models, and 13 hybrid versions. BMW's first electric Mini will be released in 2019. BMW's announcement follows an earlier one from Jaguar Land Rover. JLR said every vehicle line launched from 2020 will have an all-electric or hybrid version, the first of which would be the Jaguar I-Pace, to go on sale in 2018. BMW's Klaus Fröhlich said: "The trend towards electric mobility is irreversible. But it will happen in different ways and at various speeds in different parts of the world. The change in China is just one example." From 2020, he said, all BMW models will have an electrified version, and there will be a big push to expand the all-electric and hybrid model range over the subsequent five years. 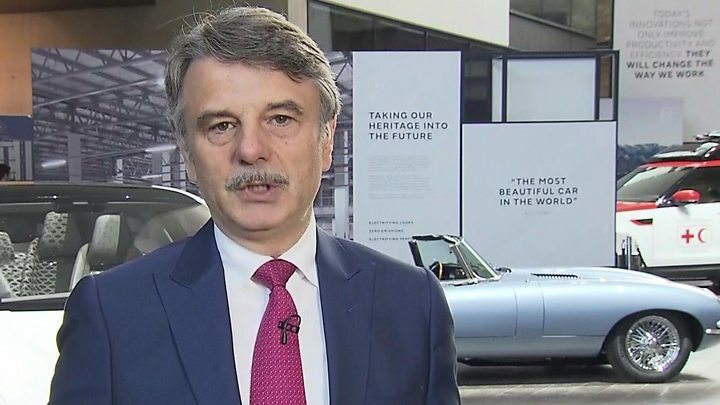 JLR's chief executive Ralf Speth said its move was aimed at "giving customers even more choice". The firm, Britain's biggest carmaker, is owned by India's Tata. In July, Chinese-owned firm Volvo said all its new models would have an electric motor from 2019, one year earlier than Jaguar's deadline. However, both Volvo and JLR will still be manufacturing earlier models that have combustion engines. "The internal combustion engine is state of the art," Mr Speth said. "We will see this internal combustion engine, petrols and diesels, for many years to come." Jaguar said it had also engineered an electric version of the classic Jaguar E-type car, known as the E-type Zero. However, it was intended as a concept car and would not be available for sale. Mr Speth was asked about how he viewed the Brexit talks. He said: "I trust that, at the end of the day, politicians are interested in a better society for their inhabitants." He pointed out that the company sources 40% of its components from the European Union, which is also its most important export market. "It is crucially important that there is free and fair trade for Jaguar Land Rover." Jaguar Land Rover and BMW - like Volvo before them - are making a virtue out of a necessity. Emissions regulations are getting much tighter in many key markets. In 2021, for example, the EU is bringing in tougher standards for CO2 emissions - and the way the rules have been drawn up means it will be very much in a carmaker's interests to have some zero emissions models in its fleet. European politicians, meanwhile, seem to be trying to outdo one another in their opposition to petrol, and especially diesel. As a result, a big push towards electrification is already under way. Most major manufacturers are currently working on high performance electric models. But it is still a small market, and the infrastructure for dealing with large numbers of battery powered cars is not yet in place. For the next few years, then, the focus is likely to be on hybridisation - fitting electric motors to cars that also have conventional engines in order to make them more efficient. The chances are that within a few years most new car models will be hybrids of one sort or another; meanwhile manufacturers will continue to produce older designs with conventional engines. Change is coming anyway - but why not grab some politically useful PR along the way? Jaguar's latest announcement comes as the car industry seeks to show its green credentials in the wake of the Volkswagen emissions testing scandal and as governments take action aimed at limiting climate change. "One thing is clear the future will be electric," Mr Speth said. "Every new Jaguar Land Rover model line will be electrified from 2020, giving our customers even more choice." "We will introduce a portfolio of electrified products across our model range, embracing fully electric, plug-in hybrid and mild hybrid vehicles." The company has also attempted to imagine what cars will be like after 2040 with its Future-Type, a concept car that will have a voice activated steering wheel. "This steering wheel doesn't just stay in your car - it lives in your home and becomes your trusted companion," Jaguar said in its press release. UK car industry expert Prof David Bailey, of the Aston Business School at Aston University, said the move was an important shift. "Jaguar Land Rover have been lagging behind. They've been too slow to see the potential of electric cars - they've been focusing very much on light-weighting their cars and developing the internal combustion engine," he said. "They've fallen behind and they're playing catch-up, so this is a significant step and it is to be welcomed." JLR will be showing off some of its innovations to the public at a three-day Tech Fest, opening on Friday at Central Saint Martins art school in London's King's Cross area of London.